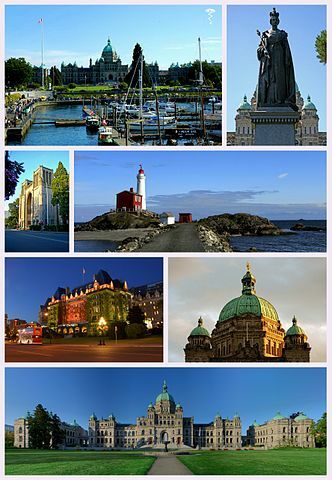 Victoria is the capital of the province of British Columbia, Canada and is located near the southern tip of Vancouver Island. 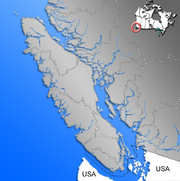 The city has a population of about 80,000 within the metropolitan area of Greater Victoria, which has a population of approx. 350,000. Known as the "City of Gardens", Victoria is an attractive city and a popular tourism destination about 100 kilometers from BC's largest city of Vancouver on the mainland and about 100 kilometers from Seattle. Victoria has the mildest climate in Canada because the Pacific ocean in this region maintains a constant temperature. Prevailing westerly ocean winds provide a buffer to warmer summer and cooler winter temperatures. Regional mountains also provide weather protection, and as a result, Victoria has the lowest rainfall on the West Coast and consequently enjoys the most days of sunshine. Victoria is the only city in Canada that has recorded winters when the thermometer did not drop below freezing. Even in January the temperate climate allows outdoor activities such as fishing, sailing and golfing in the coastal areas. Victoria boasts the mildest climate in Canada. Victoria receives an average of 2,183 hours of sunshine each year, with flowers in bloom year-round and an eight-month frost-free season spring arrives as early as February and is mild. Summer is comfortably warm and dry with temperatures from 18° to 32°C. Victoria has a very low humidity ratio and almost constant offshore breezes, which keep summer days from becoming too hot and summer evening’s cool. A sweater or light jacket is recommended if you are going out at night. The average monthly rainfall in summer is less than 2.5 cm. Victoria often enjoys a warm, sunny September with fall arriving late in the month. The rent varies from $400 per room to $1,100 one bedroom apartment. Usually landlords ask for references and some even for credit checks. However, if you are a foreign student for the first time in Canada they might waive these requirements as they would know you cannot provide them. Also check the homestay programs of the school you are going to attend. Have you lived in this city as a foreign student? Do you have any tips for living and studying in this city? Share it!